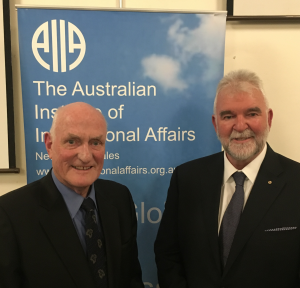 Last Tuesday 26 September, the AIIA hosted Michael Griffin AM, former army brigadier and current head of the Australian Commission for Law Enforcement Integrity (ACLEI). During an engaging presentation, Mr Griffin provided insight into the role of ACLEI in investigating corruption within commonwealth law enforcement agencies, an outline of his powers as Integrity Commissioner, and an overview of what he perceives to be the greatest challenges to Australia’s border security in the near future. Mr Griffin began his presentation by explaining the role of ACLEI and his powers and responsibilities as Integrity Commissioner. He stated that the purpose of ACLEI was to investigate all Commonwealth agencies within the jurisdiction of the Law Enforcement Integrity Commissioner Act 2006. Noteworthy bodies that fall within this legislation include: the Australian Federal Police (AFP), the Australian Transaction Reports and Analysis Centre (AUSTRAC), the Department of Immigration and Border Protection (including the Australian Border Force), and the Australian Criminal Intelligence Commission. His presentation revealed the sweeping powers available to him as Commissioner, most notably the power to conduct coercive investigative hearings, electronic surveillance, scrutinise any financial transaction records and intercept personal telecommunications. He was, however, quick to reassure the audience that such powers are strictly scrutinised by a bipartisan Parliamentary Committee, and also require regular reporting to the Minister for Justice justifying their use. Mr Griffin focused on how corruption within the Australian Border Force enables visa fraud, weapons trafficking, and drugs smuggling. Using a number of illuminating examples from his investigations, he revealed that if corruption was an industry, it would rank as the third largest globally. He noted that corruption within the Australian Border Force has enabled illegal activities. For example, of eight million visas issued last financial year, one percent – some 80,000 – could have been issued fraudulently. Some of these could have been issued for the relatively innocuous purpose of granting tourist visas to overseas family members of the Department of Immigration or Border Force officers, but an unknown proportion could have been used to facilitate the entry of criminals into Australia. Mr Griffin examined the areas he believed would present the greatest threat to Australia’s border security. Developments in the dark net such as TOR, and the rise of cryptocurrencies such as Bitcoin, presented significant enablers to organised crime. Internal factors such as corruption and nepotism also played a significant part in compromising Australia’s border security. He emphasised the importance of effective middle management. A breakdown here was one of the greatest enablers of corruption among junior officers. Poor leadership created the environment that ultimately led to lower level officials accepting bribes and abusing their position to facilitate illegal activities. He concluded by saying that it is inevitable that corruption will exist in any organisation, and that his position and role in ‘guarding the guards’ is a necessary step in ensuring transparency.